Whangarei, is the northernmost city in New Zealand and the regional capital of Northland Region. Although it is commonly classified as a city, officially it is under the jurisdiction of the Whangarei District Council, a local body created in 1989 to administer both the city proper and its hinterland. The city population was estimated to be 51,100 at the June 2008 estimate, up from 47,400 in 2001. The Whangarei urban area includes the suburbs of Kamo, Tikipunga, Otangarei, Mairtown, Riverside, Sherwood Rise, Onerahi, Morningside, Raumanga, Maunu, Horahora, Woodhill, Kensington and Whau Valley. Captain James Cook and the crew of the Endeavour were the first Europeans to contemplate the Whangarei Harbour entrance. On 15 November 1769 they caught about one hundred fish there which they classified as 'bream' (probably snapper) prompting Cook to name the area Bream Bay. Nga Puhi was the Maori iwi which occupied Whangarei from the early 19th century, and Te Parawhau was the hapu living at the head of the harbour. In the 1820s the area was repeatedly attacked by Waikato and Ngati Paoa raiders during the Musket Wars. The first European settler was William Carruth, a Scotsman and trader who arrived in 1839 and was joined, six years later, by Gilbert Mair and his family. For the most part, relations between the settlers and local Maori were friendly, but in February 1842, all settler farms were plundered in revenge for transgressions of tapu by one. In April 1845, during the Flagstaff War, all settlers fled from Whangarei. Most of the original settlers never returned, but by the mid 1850s there were a number of farmers and orchardists in the area. From 1855, a small town developed, driven by the kauri gum trade. Today's 'Town Basin' on the Hatea River was the original port and early exports included kauri gum and native timber followed later by coal from Whau Valley, Kamo and Hikurangi. Coal from the Kiripaka field was exported via the Ngunguru River. By 1864, the nucleus of the present city was established. Fire bricks made from fire clay deposits near the Kamo mines supported a brick works over several decades. Good quality limestone was quarried at Hikurangi, Portland, and Limestone Island, and initially sold as agricultural lime and later combined with local coal to produce Portland cement at the settlement of Portland on the south side of the harbour. Local limestone is still used in cement manufacture but the coal is now imported from the West Coast of the South Island. Whangarei was the most urbanised area in Northland towards the end of the 19th century, but grew slowly in the 20th century. The district slowly exhausted most of its natural resources but was sustained by agriculture, especially dairying. Shipping was the main transport link until the North Auckland railway line reached the town in 1925, and the road from Auckland was not suitable for travel in poor weather until 1934. These terrestrial travel routes forced a rapid decline in coastal shipping but stimulated Whangarei to become the service centre for Northland. The population was 14,000 in 1945, but grew rapidly in the 1960s, incorporating Kamo and other outlying areas. In 1965, Whangarei was declared a city. Its population the following year was 31,000. The second half of the twentieth century brought the establishment and expansion of the oil refinery at Marsden Point on Bream Bay and the adjacent development of timber processing. 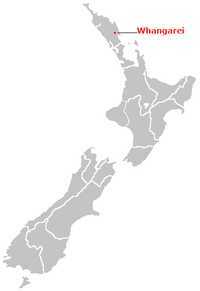 A container port could follow, linked by rail to Auckland. Whangarei Boys' High School is a boys' secondary school with a roll of 1060. Whangarei Girls' High School is a girls' secondary school with a roll of 1127. These two secondary schools have a decile rating of 5 and cover years 9-15. Both schools opened in 1881. Whangarei Intermediate is an intermediate years 7-8) school with a roll of 639. Whangarei School is a contributing primary (years 1-6) school with a roll of 577. Blomfield Special School and Resource Centre provides education and care to students between the ages of five and twenty-one years, and has a roll of 68. The school operates from five locations, four in Whangarei and one in Kaitaia. Christian Renewal School is a composite (years 1-15) school with a roll of 151. The school was established in 1993 and integrated into the state system in 1997. The school operates in the Christian Renewal Church buildings. These four schools are all coeducational, and all have a decile rating of 4 except for the Christian Renewal School, which has a decile of 5. Brad Carter, member of rock band Steriogram, attended Kamo High School. Billy T. James, Comedian, attended Whangarei Boys' High School. Jane Mander, novelist, died in Whangarei in 1949, at the age of 72. Jack Marshall, Prime Minister of New Zealand for part of 1972, attended Whangarei Boys' High School. Winston Peters, former Minister for Foreign Affairs, leader of New Zealand First Party. Alfred Hamish Reed, publisher, had a farm in the district and donated the A H Reed Memorial Kauri Park of 20 acres (8.1 ha) to the city. Tim Southee, Black Caps Cricketer. Keith Urban, Country singer, born in Whangarei, husband of Nicole Kidman. Samantha Warriner, silver medallist in the Women's Triathlon at the 2006 Commonwealth Games, lives there. Mt Parihaka is a volcanic dome rising 241 m to the northeast of the city centre. It is about 20 million years old, and part of the Harbour Fault which also includes Parakiore near Kamo, and Hikurangi near the town of the same name. The dome is surrounded by the Parihaka Scenic Reserve. There is road access to the summit of Parihaka, and walking tracks through the reserve. The dome is frequently called Mount Parahaki, but the original Maori spelling of Parihaka was confirmed by the government in 2005. The Hatea River flows south through the city and empties into Whangarei Harbour. 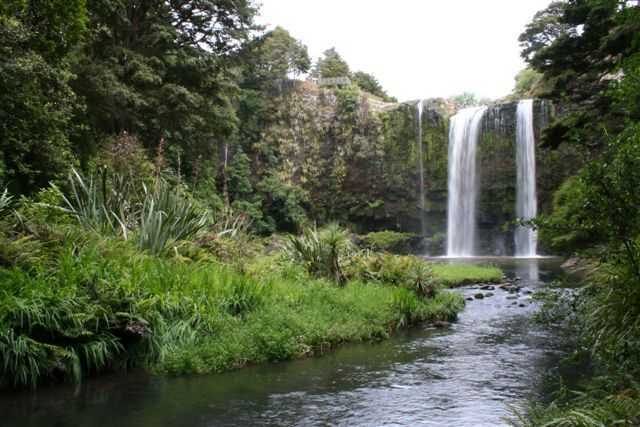 The river has a spectacular 26 m waterfall in Tikipunga, 6 km north of the city. Whangarei has a subtropical climate and very few frosts. Summers rarely exceed 30°C, and there is plentiful rainfall, spread relatively evenly over the year. This page was retrieved and condensed from (http://en.wikipedia.org/wiki/Whangarei) see Wikipedia, the free encyclopedia, January 2009.